Patella alta or high-riding patella refers to an abnormally high patella in relation to the femur. The patella sits high on the femur where the groove is very shallow. Here, the sides of the femoral groove provide only a small barrier to keep the high-riding patella in place. This condition has been associated clinically with patellofemoral dysfunction and is considered a predisposing factor for the development of patellofemoral pain (PFP). Patella alta is also characterized as instability of the patella. With radiographic measurements, patella alta is defined as a Caton-Deschamps index (CDI) of > 1.2 to > 1.3, an Insall-Salvati index (ISI) of > 1.2, a Blackburne-Peel index (PBI) of > 1.0 and a patellotrochlear index (PTI) of < 0.125 to 0.28.6,26. The patella is a flat, inverted triangular bone, situated on the front of the knee joint. The patellofemoral joint is the portion of the knee joint between the patella and the femoral condyles. The patellofemoral articulation totally depends on the function of the which are connected to the patella with a shared tendon. The quadriceps femoris is divided into four different muscles with the same insertion on the patella: the rectus femoris (RF), the vastus lateralis (VL), the vastus intermedius (VI) and the vastus medialis (VM). There is also a tendon that connects the bottom of the patella to the tibia, called the patellar tendon. This tendon is extremely strong and allows the quadriceps muscle group to straighten the leg. These three bones are covered in articular cartilage which is an extremely hard, smooth substance designed to decrease the friction forces. The patella lies in an indentation of the femur known as the intercondylar groove. A common symptom of patellar injury and dislocation is acute pain after direct contact or sudden change of direction. With sudden changes in direction, the femur medially rotates over the ground-stabilized tibia. Under these conditions, athletes commonly feel the knee giving way, which is the result of quadriceps inhibition from pain, a physiologic protective mechanism. Rapid swelling, intense knee pain, and difficulty with any knee flexion usually occur. Other dysfunctions with similar presentations and mechanism of injury are meniscal and ligamentous injuries, particularly injuries of the anterior cruciate ligament. Patella alta is mostly defined with imaging-based measurements and rarely by description. Imaging includes lateral radiographs, sagittal MRI, radiographic ratios measured on MRI, and patellar tendon length.cutoff values for patella alta varied from > 1.2 to > 1.5 for ISI and from > 1.2 to > 1.3 for CDI. Both indices were seldom used on MRI; cutoff values were similar to those for conventional radiographs. On sagittal MRI, the patellotrochlear index was used most; cutoff values ranged from < 0.125 to 0.28. Eleven studies used patellar tendon length and found it was increased (> 52 mm to > 56 mm). Several methods are used to determine the presence of patella alta. 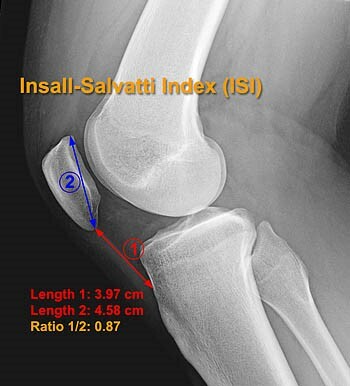 Insall-Salvati were the first to describe a method of establishing patella height on the basis of the ratio of the length of the patella tendon to the diagonal length of the patella on lateral radiographs. Various techniques, including those by Blackburne and Peel, Caton et al., and de Carvalho et al., have since been developed in the attempt to classify patella position. A normal value of the patella is a ratio between 0,8 – 1,2. If the ratio is higher than there is patella alta. 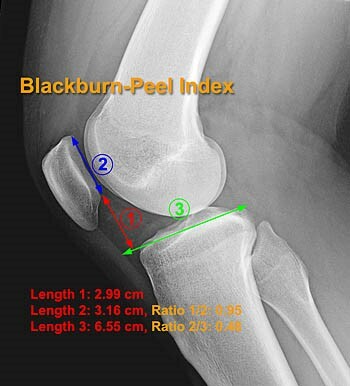 The Blackburne-Peel index can also be used to determine the presence of patella alta. In this method a lateral radiograph of the knee with 30° degrees of flexion is obtained. The lengths of three surfaces must measured to determine if there is patella alta. The first length is a vertical line between the top of the inferior aspect of the patella articular surface and the horizontal line of the tibial plateau. The second length is vertical and is the superior patella articular surface. Both vertical lines are measured on the posterior side of the patella articular surface. The third length is a horizontal line on the tibial plateau. This technique is not easy on a MRI, because it requires measurement across different sections. A normal value of the patella is a ratio between 0,5 – 1,0 . When the ratio is higher than 1,0, there is patella alta. The Caton-Deschamps index is the most commonly used radiographic technique for evaluation of patellar height. This is measured on a lateral radiograph of the knee in 30° degrees of flexion. This technique is easy to measure on a MRI. To determine to height of the patella. We measure the length of inferior articular surface and the anterior lip of the tibial plateau. A normal value of the patella is a ratio between 0,6 – 1,3. When the ratio is higher than 1,3, there is patella alta. The patient sits on the edge of the examination table with the feet on the ground. The knees are bent at 90 degrees, and the thigh is horizontally positioned. The vertical position of the patella height is best observed from lateral. In Patella Alta it can be seen that the partially tilted patella protrudes above the level of the thigh. This is more remarkable In a unilateral Patella alta. A patella alta may be noticed during inspection thanks to a so-called Camel hump patella The knee has two striking bulges: one is the tibial tuberosity, the other one is the patella. The space distal to the patella and proximal to the fat body of Hoffa is characterized by a notch. The second diagnostic step is a careful, complete and essential physical examination. The purpose of this examination is to reproduce the symptoms (pain/instability) and to locate the painful zone. The location can indicate which structure is injured, it is truly helpful to compose the diagnosis and to plan the treatment. The test is positive, when there is pain and muscle defensive contraction of lateral patellar dislocation with 20°–30° of knee flexion. The positive test indicates that lateral patellar instability is an important part of the patient’s problem. This may be so positive that the patient pulls the leg back when the therapist approaches the knee with his hand, preventing so any contact, or the patient grabs the therapist’s arm. This test is used to evaluate the instability. A medial/lateral displacement of the patella greater than or equal to 3 quadrants, with this test, is consistent with incompetent lateral/medial restraints. Lateral patellar instability is more frequent than medial instability. Tibial tuberosity osteotomy can be performed in patients with patella alta. With this surgery they move the attachment of the patellar ligament downwards to the tibia. The patella is also attached to this ligament, so the patella moves downwards. The quadriceps angle can be increased with patella alta, this can be corrected by shifting the bony attachment of the patellar ligament inwards. Bracing has been found to decrease pain and increase patellofemoral contact area in patients with patellofemoral dysfunction and anterior knee pain. However, in a study to assess the effect of a brace developed to prevent medial and lateral patellar subluxation, Shellock, et al (1994) demonstrated that the brace was ineffective in the presence of patella alta. Of the five knees that did not show improvement in this study, four of them had patella alta. Because the brace used in this study only provided stabilization for medial and lateral patellar glide, it might not have been the most optimal brace design for individuals with patella alta. It is a treatment that consists of immobilization followed by a period of structured rehabilitation. Immobilization is granted for healing of the soft tissues, especially the supporting structures on the medial side of the knee. Today brace treatment with early mobilization has become the norm, instead of the traditional immobilization of 3 to 6 weeks in a cylinder cast. Most of the time these therapies start with the initial straight-leg raises: Quadriceps setting exercises and three sets of 15 to 20 straight leg raises are done four or five times a day during the acute period. Ice is applied for 20 minutes every 2 to 3 hours to reduce swelling. It is followed by stationary bicycle for passive and active motion, isotonic and isometric quadriceps strengthening. Between 3 and 8 weeks, the return to full activities was allowed when tenderness weakened and isotonic quadriceps strength was bilateral. In up to two-third of the knees the results were good to excellent, these results consist of a first-time acute dislocation, compared with only 50% of those with a recurrent dislocation. In general, 73% were satisfied with their knees, but 16% were not and eventually decided to have surgical stabilization. Those with acute patellar dislocation can expect an extended rehabilitation period before returning to sport, whether immobilized or not. ↑ Askenberger M, Janarv PM, Finnbogason T, Arendt EA. Morphology and anatomic patellar instability risk factors in first-time traumatic lateral patellar dislocations. Am J Sports Med. 2017;45(1):50-58. ↑ Otsuki S, Nakajima M, Fujiwara K, et al. Influence of age on clinical outcomes of three-dimensional transfer of the tibial tuberosity for patellar instability with patella alta. Knee Surg Sports Traumatol Arthrosc. 2017;25(8):2392-2396. ↑ Magnussen RA, De Simone V, Lustig S, Neyret P, Flanigan DC. Treatment of patella alta in patients with episodic patellar dislocation: a systematic review. Knee Surg Sports Traumatol Arthrosc. 2014;22(10):2545-2550. ↑ Van Duijvenbode D, Stavenuiter M, Burger B, van Dijke C, Spermon J, Hoozemans M. The reliability of four widely used patellar height ratios. Int Orthop. 2016;40(3):493-497. ↑ Ali SA, Helmer R, Terk MR. Patella alta: lack of correlation between patellotrochlear cartilage congruence and commonly used patellar height ratios. AJR Am J Roentgenol. 2009;193(5):1361-1366. ↑ Biedert RM, Albrecht S. The patellotrochlear index: a new index for assessing patellar height. Knee Surg Sports Traumatol Arthrosc. 2006;14(8):707-712.